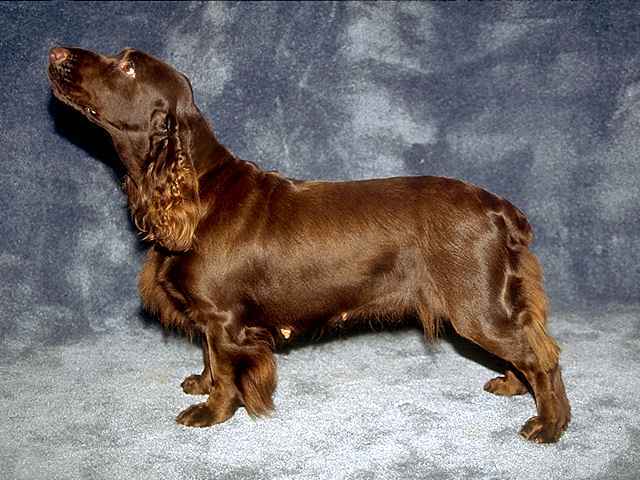 The Field Spaniel is a medium sized dog that is heavier and longer in body than its better known cousin, the Cocker Spaniel. 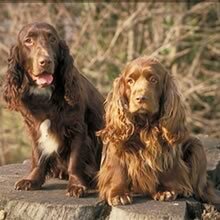 These dogs have a beautiful glossy coat, flat or slightly wavy and moderately long. The legs, chest, and ears may have a moderate amount of feathering. Coloring can be solid or bicolored, liver, golden liver or black, with roaned or ticked areas, and occasionally some white on the chest. The eyes are almond shaped, dark brown or hazel, and convey a look of concern and gentleness. Long broad ears hang down from the sides of the head. The muzzle is long and lean with well developed nostrils for scenting birds in the brush. 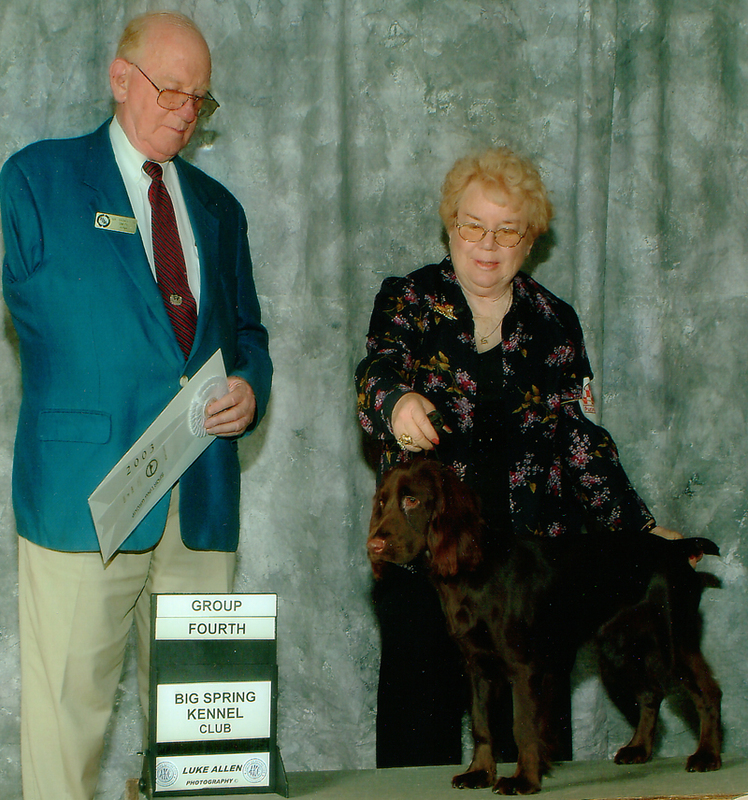 The Field Spaniel is slightly longer than it is tall. The neck is long and well muscled and the body athletic; the tail may be docked or left natural. 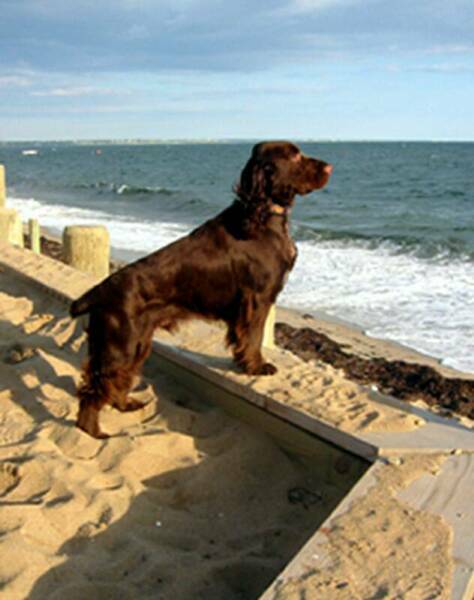 Height (Male) 17 - 19"
Common Misspellings Feild Spanial, Feeld Spaniel or Field Spanul. Harsh training will not work with this sensitive dog, and may in fact alienate him. 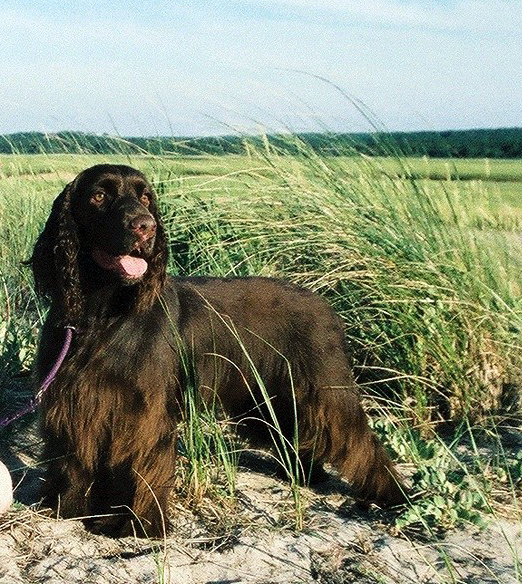 The Field Spaniel gets along exceedingly well with cats, dogs and children, and gets along moderately well with strangers; typically, a stranger requires only a brief evaluation to be accepted by this dog. 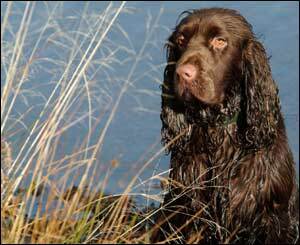 The Field Spaniels hunting roots are ever present, and the dog has an abundant love of work and play. 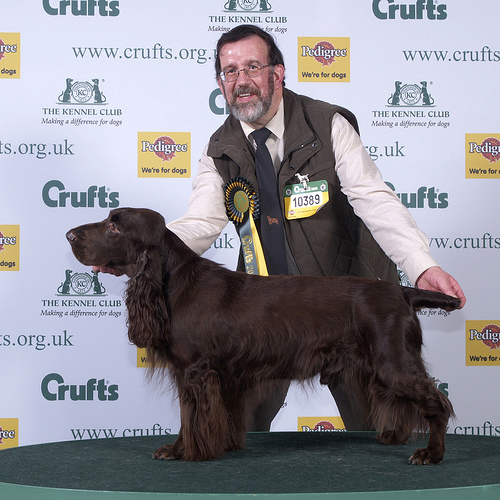 In fact, finding a task for your Field Spaniel to perform is likely to keep him happy and out of trouble. Do not let this dogs kind demeanor fool you it needs as much action and excitement as any retriever. 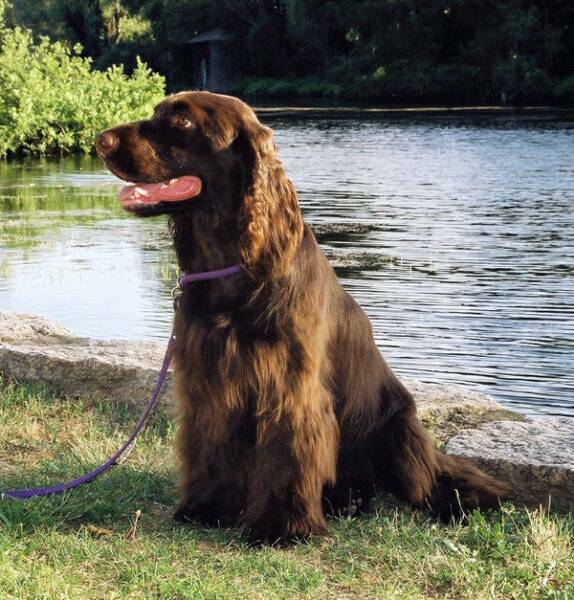 Due to their tendency to follow their noses a Field Spaniel should be kept on a leash unless the owner is away from streets and sure of the animals obedience. The silky coat needs to be brushed once or twice a week. Heavy hanging ears can be prone to infections and should be kept clean. These dogs are only moderate shedders. 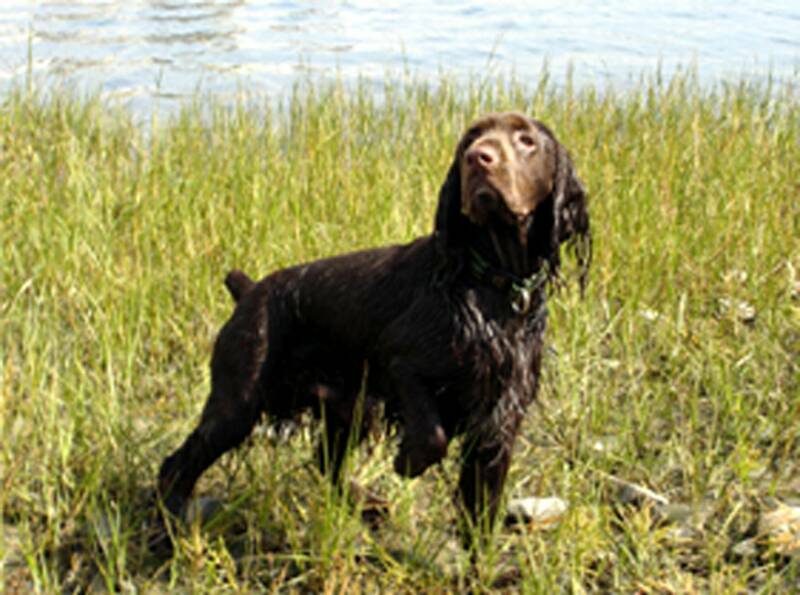 Health conditions seen in the Field Spaniel include canine hip dysplasia, hypothyroidism, and otitis externa. 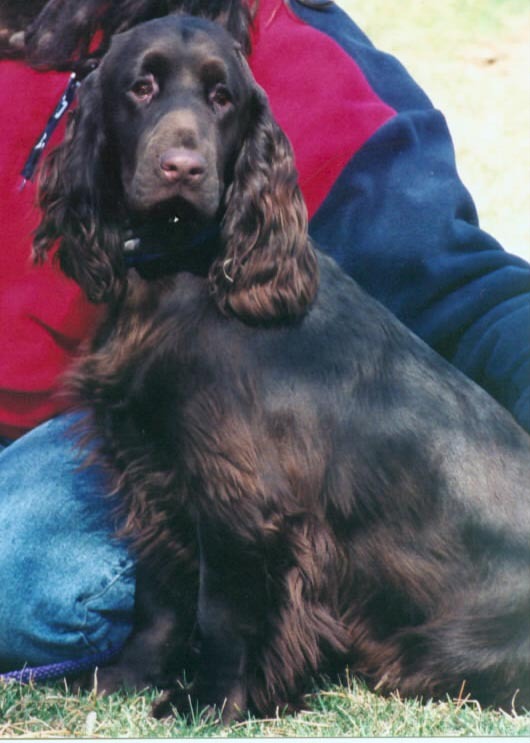 Descended from the Cocker, Sussex and English Water Spaniel, the Field Spaniel was the result of an attempt to create a darker colored and more rugged spaniel that would excel both in the field and the ring. 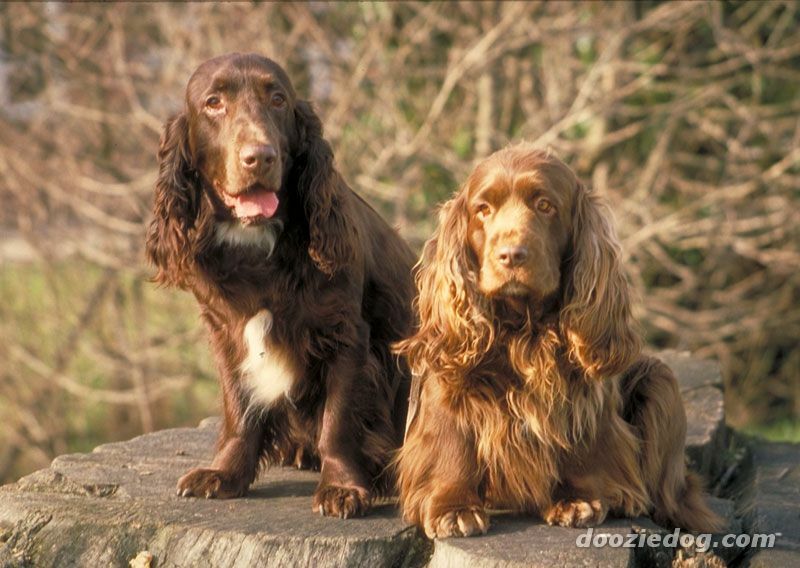 The breed was recognized by the American Kennel Club in 1894.During the late 19th century, breeders took the Field Spaniels distinct characteristics too far, creating a dog that was heavy boned, short of leg and long in spine. This new dog had neither the hunting nor show ability of its forebears, and quickly fell out of favor. 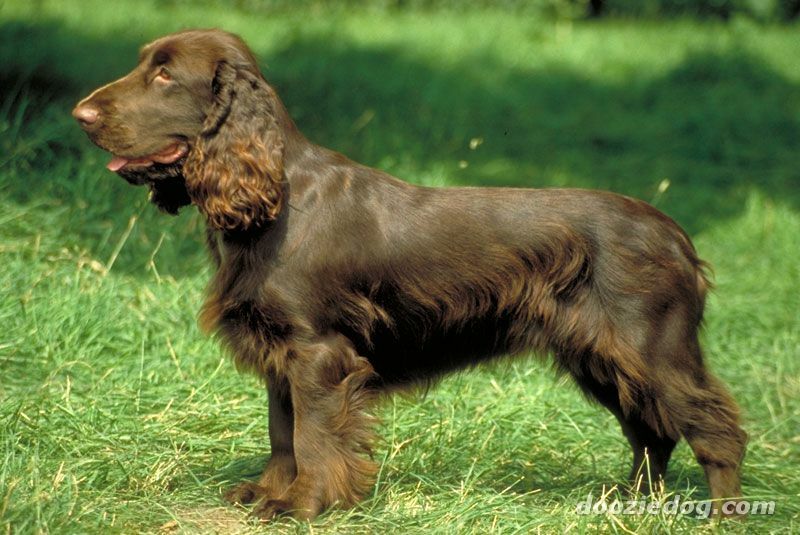 By the beginning of the early 20th century the Field Spaniel was near extinction. 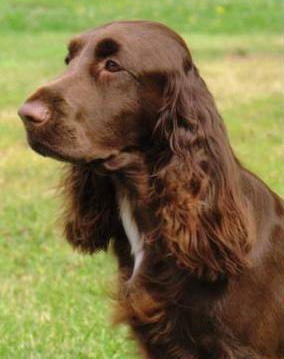 Noting the animals peril, Field Spaniel proponents experimented with crosses with other spaniels, including the English Springer Spaniel, in an attempt to replicate the original Field Spaniel. These efforts were successful, and by the 1950s the breed had regained its regal appearance, and had attained a sustainable population. 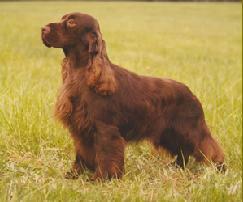 To this day, however, the Field Spaniel is rarely seen in North America.